Rustam Inoyatov was sacked on 31 January 2018. In September 2017, 23 international human rights organizations asked US Government to impose financial sanctions and visa restrictions on Inoyatov. Couple of weeks later, OSI started a series of investigative articles, documenting Rustam Inoyatov’s chekist biography, his rise to complete power, the history of human rights violations and widespread political repression. After decades of fear, unwillingness and complicity, OSI followed Rustam Inoyatov’s money, unveiling his family’s properties and companies around the world. We will continue to investigate and report on Rustam Inoyatov. He is no longer the head of Uzbekistan’s National Security Service, but his vast network of allies built up over the past 23 years remains almost intact. And so does his business empire. A graduate of Tashkent State Institute of Oriental Studies, Sharif Inoyatov (born 10 May 1974) is Rustam Inoyatov’s son. After studying abroad for a couple of years in the early 90s (at Al-Azhar University in Cairo), Sharif Inoyatov graduated with a major in economy. With his father turning Uzbekistan’s National Security Service (SNB) into a family business and with SNB overseeing country’s economy, Sharif Inoyatov became a very successful and wealthy entrepreneur. As revealed by OSI, Sharif Inoyatov invested heavily in Austria, including in a multi-million dollar mansion in Vienna (https://www.opensourceinvestigations.com/) and is the owner of Uzgardens, the largest supplier of Uzbek dried fruits and vegetables to Russia (https://www.opensourceinvestigations.com/). Uzgardens is a large enterprise, but Inoyatov family’s business interests in Russia are vast and varied. On 13 April 2014, Sharif Inoyatov and two business partners founded Neva Alyans Grupp, a Sankt Petersburg-based limited liability company. Rustam Inoyatov’s son owns 50 pecent of the company, his partners, Ravshan Ubaidullaev and Bakhtiyor Fazylov, own 25 percent each. 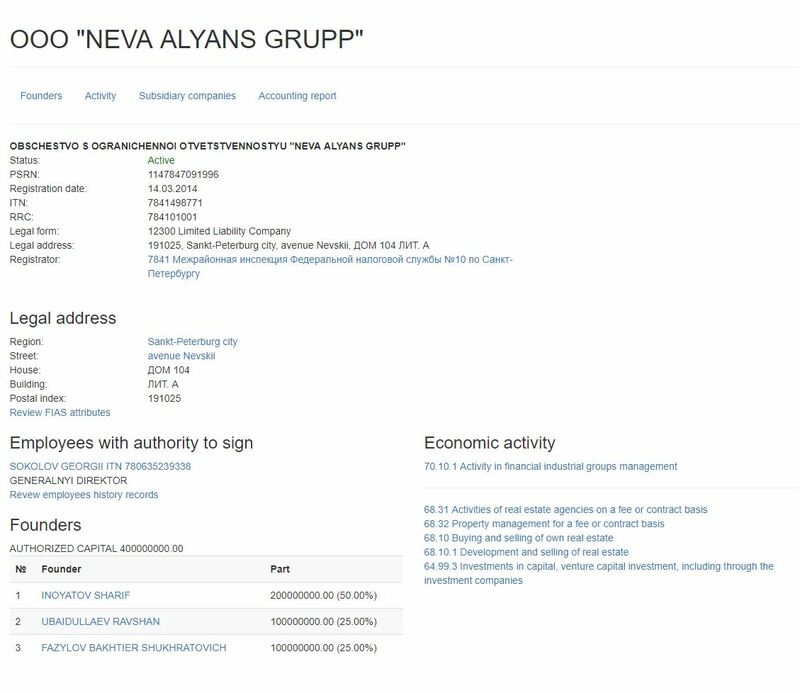 Neva Alyans Grupp, whose main business activity is the ownership and management of real estate assets, has an authorized capital of 7 million dollars (400 million roubles). Sharif Inoyatov alone invested $3.5 million in the company. Neva Alyans Grupp’s headquarters are located in the historical center of Sankt Petersburg, on 104 A, Nevsky Prospect avenue. Nevsky Prospekt is Sankt Petersburg’s main boulevard and one of the most famous boulevards in Russia. 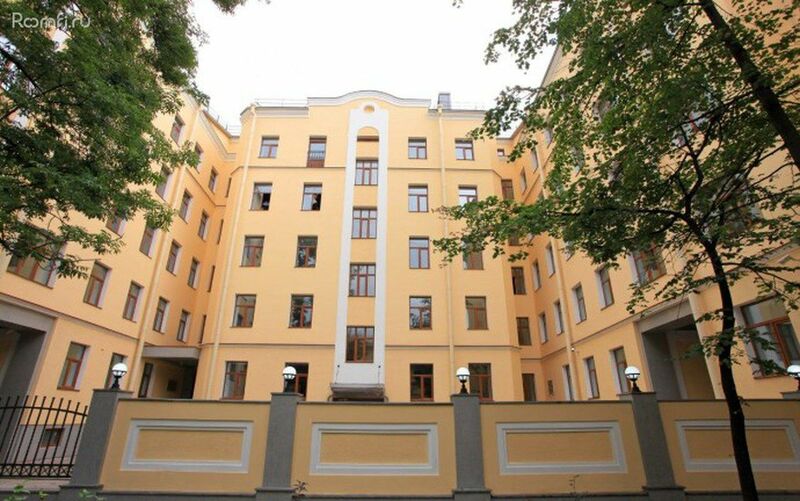 104 A is a recently renovated luxury office building, behind the famous Sankt Petersburg Interior Theatre. 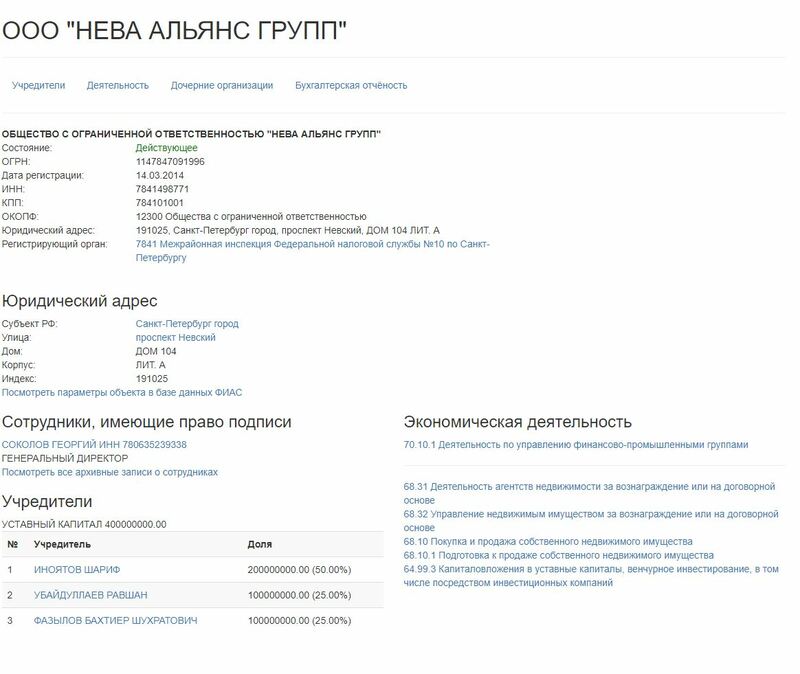 Another company controlled by Sharif Inoyatov’s is headquartered at the same address as Neva Alyans Grupp: 104 A, Nevsky Prospect. 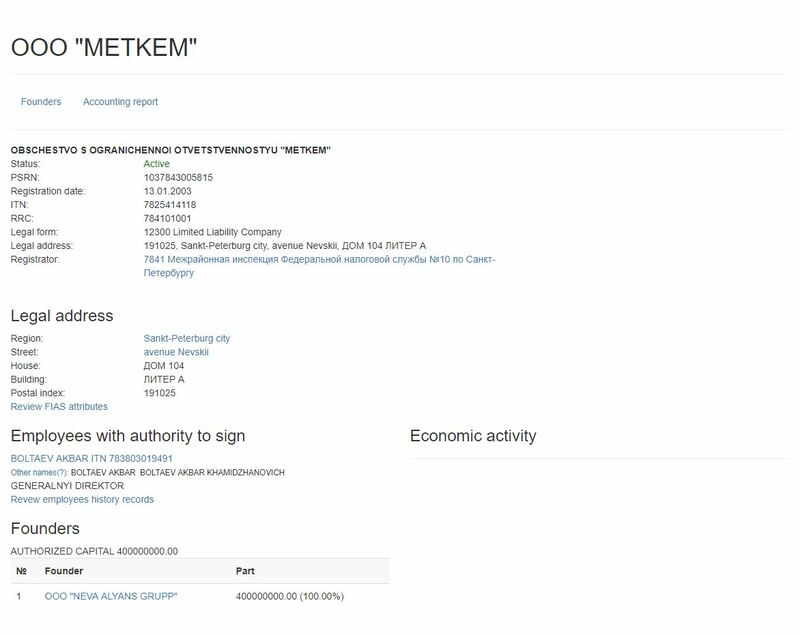 The company is called Metkem and is wholly owned by Neva Alyans Grupp. 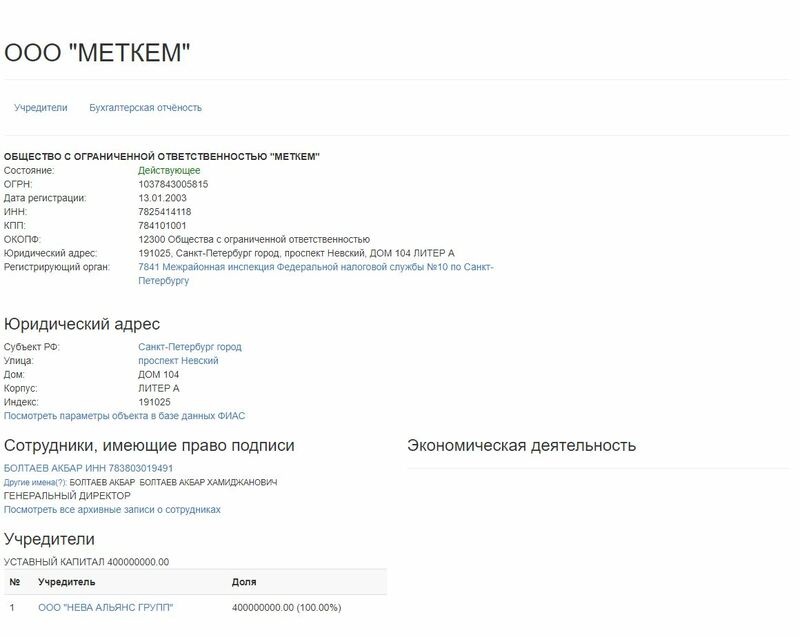 Metkem has an authorized capital of 7 million dollars (400 million roubles) and is a prominent real estate developer in the Sankt Petersburg area.